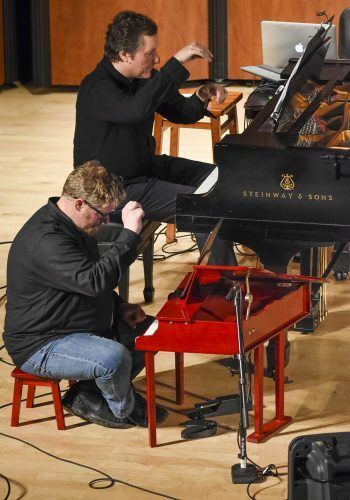 “Piano(+),” a piano recital that focused on electro-acoustic pieces, was held Saturday in Morgan Auditorium. The program was presented by adjunct piano professor Rafael Liebich, and the People Inside Electronics, a concert series devoted to live electro-acoustic music in Los Angeles. The program consisted of seven compositions, with four in the first half and the last three after a brief intermission. The pieces performed were all by composers who are still alive today, including an old college friend of Liebich’s. Tom Flaherty composed “Airdancing,” the third piece Liebich played. Flaherty and his wife were guests in the audience as well and had nothing but praise for Liebich. All of the electronic sounds within the piece are samples of simple manipulations of a small, red toy piano, which was also on stage with Liebich as he performed. The second half of the program started off with the only piece involved that had no electronics, “Mobile.” This piece was written by Liebich’s old friend from college, Michelle Agnes, and involved altering of the instrument. The next piece was new, and had only been performed live once before. The piece, “Finding Breath,” was commissioned by Alexander Miller, and performed by Liebich on the piano and Alex Russell on the violin. One piece performed, “Man on Wiire,” required the use of a Nintendo Wii controller. The piece, composed by Isaac Schankler, uses the Wii controller as an accelerometer, which electronically modulates the piano’s sound. The piano piece and a device called “the patch” were designed by Schankler. The piano has microphones inside of it, which is how the patch records what Liebich is playing in real time. The patch then manipulates and processes what was recorded. Liebich explained that he does a lot more than just play the piano. He tries to incorporate many different aspects into not only his own performances, but those of the People Inside Electronics concert series, too. The next music department concert is a performance by Grace Xia Zhao at 6 p.m. Sunday in Morgan Auditorium.